The Wilmer Stretching Orthosis, abbreviated WSO, is a lightweight arm orthosis (also called brace or splint) from the Wilmer line, developed at Delft University of Technology. 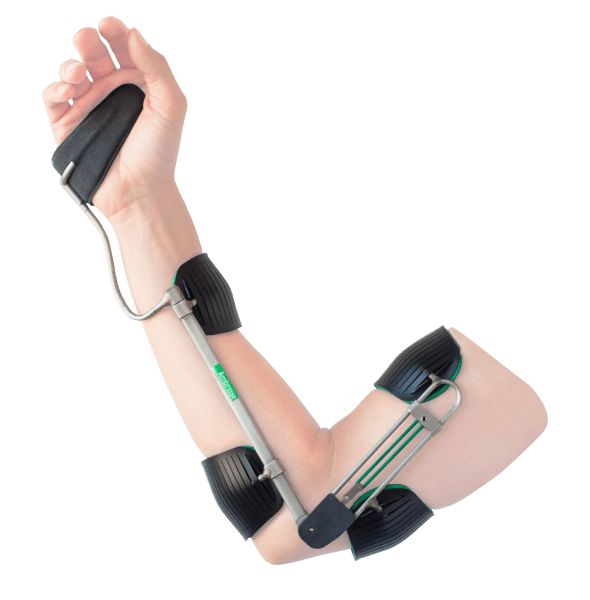 The orthosis helps to stretch the arm through an adjustable spring mechanism. A Wilmer Stretching Orthosis, for whom? The WSO is designed for people having trouble to stretch their elbow. Being unable to stretch the arm leads to loss of function of the arm, pain and discomfort. If the arm is not stretched for a long time, shortening of the muscles can occur, making stretching even more difficult. This is called a contracture. Elbow function restored by adjustable spring mechanism. Spring can be doubled for extra strength. Intended to support arm stretching (extension). Contracture treatment (eg due to spasms). In case of imbalance between bending muscles (biceps – too strong) and stretching musles (triceps brachii muscle – too weak) of the arm. Open structure so good ventilation. Tilting self-adjusting pelottes for perfect transfer of pressure on the skin. Only supports the paralyzed arm, but the fingers and hand remain free. Supports arm but also the hand with a handsupport. All units are available in one size in left and right models. The orthosis is usually carried on the inside of the arm. Optionally carried on the outside of the arm. For example as a night splint to avoid contact between the orthosis and the torso. In that case a left version is carried on the right arm and vice versa. The Wilmer Stretching Orthosis is suitable for forearms with a length between 18 en 25 cm. Measured from biceps in 90° till wrist. Is support needed in flexion? Then the Wilmer Stretching Orthosis is not suitable and the Wilmer Elbow Orthosis should be considered. If the arm can not be stretched for a long time (and thus remains in a bent position), a shortening of the bending muscle (biceps) often occurs. The more serious the shortening, the more difficult it is to stretch the arm. This type of shortening, that results in a joint no longer having its full range of motion, is called a contracture and generally requires treatment. Stretching the shortened structures again requires time. Spasms that lead to a contracture usually have a cause (eg stroke/CVA), which causes the complaints to not be restricted to the elbow. 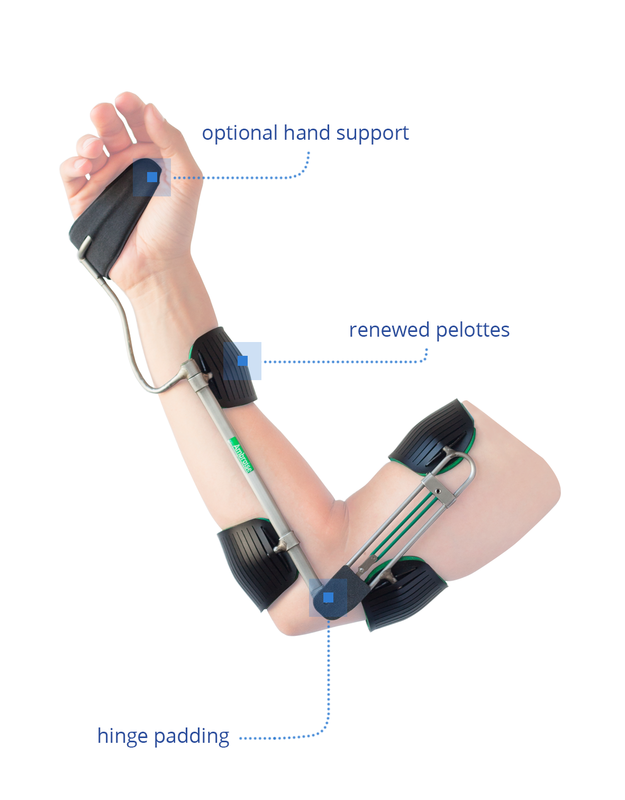 Therefore, the Stretching Orthisus is also available in an version that supports the wrist and hand. When treating a contracture due to shortened tendons or muscles, it is important that the structures are tensioned and held so that they can slowly retract slightly. Time is much more important than force. There is no point in pulling harder if you’re already at the limit. Certainly if wearing the orthosis that has to do this, becomes uncomfortable so that you can only wear it for short periods, then it even works counter-productive. It is better to adjust the orthosis so that it is good and comfortable to wear, but brings the joint for a long time to the end position. We know that this slow, long lasting stretch gives the most lasting effect. That is why Ambroise also believes that the orthosis should be comfortable. Our custom made Stretching Orthosis is that for sure. And in addition, in our eyes searching for the correct force is important. Therefore, the Stretching Orthosis is well adjustable over a wide range, so we can set it to ‘enough to correct by wearing it a long time’. A trained professional, like a certified orthotist, can help you in this process. That “wearing a long time” can also be done at night, so that during sleep the orthosis can just do its job. Even though the orthosis also works well during the day, you may need the elbow more often during the day so that there is no correction at that moment. That’s why the Stretching Orthosis is definitely an option as a night splint. The orthosis is often carried on the outside of the arm. Then there is less material between the arm and the torso so that is more comfortable while sleeping. Wearing it outside makes the orthosis more visible, of coarse, but for a night splint that’s less of a concern. How do I get a Wilmer Stretching Orthosis? The Wilmer Stretching Orthosis is custom made. For optimal operation and good comfort it is important that the orthosis fits well. The orthosis can only do its work properly if it is worn for a long time a day (or night). That’s why the orthosis is always measured and fitted by professionals (certified orthotist). The Wilmer Stretching Orthosis is prescribed by your attending physician. In most cases, this will be the rehabilitation consultant or physiatrist. In many cases, approval must be sought from your insurer. All insurers in the Netherlands pay the Wilmer Stretching Orthosis provided there is a correct indication for it. Do you want a non-binding advise from one of our clinical experts about the possibilities of a Wilmer Stretching Orthosis in your situation, or do you want to know which professionals in your area have experience with this orthosis? Feel free to contact us. We are happy to assist you. How does a Wilmer Stretching Orthosis work? The Wilmer Stretching Orthosis contains a spring mechanism that helps to stretch your arm. The spring force of the stretching mechanism is adjustable over a wide range, so that the correct moment can be adjusted around the elbow. The Stretching Orthosis is also individually tailored. 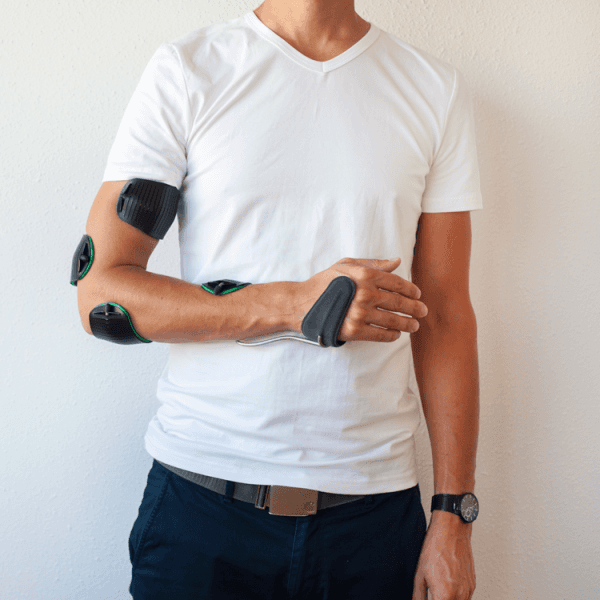 This makes this lightweight orthosis one of the most comfortable in its kind: just enough power, but not too much, in a well-fitted orthosis. Wilmer Stretching Orthosis with hand support, seen from the inside of the arm. The Wilmer Stretching Orthosis is available in two versions. 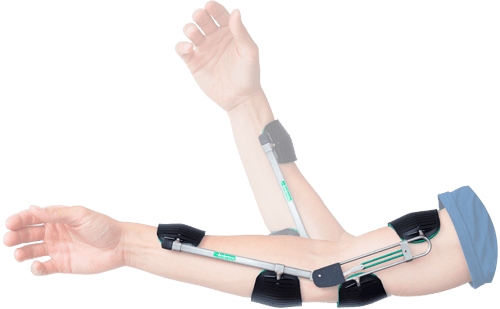 The standard model only supports the affected elbow and leaves the hand and fingers free. The hand model also supports the hand with the aid of a hand support. All models are available in a left or right version and are custom made and adjusted. The Stretching Orthosis is usually carried on the medial side but can also be made in a lateral version as a night splint so that during sleeping the orthosis irritates the body as little as possible.